Our White Melamine material uses a decorative melamine resin applied to a composite core for durability. 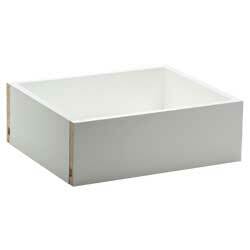 White Melamine is available for doweled drawer boxes, either assembled or unassembled. White Melamine has a protective layer on it so your boxes won't need any additional finishing or treatment and they are easy to clean with a soft cloth and warm water.